This theme article needs cleanup. Please review Wikiquote:Templates, especially the standard format of theme articles, to determine how to edit this article to conform to a higher standard of article quality. You should also check this article's talk page to see if the person who added this message left an explanation there. This page has been listed as needing cleanup since 2014-05-13. 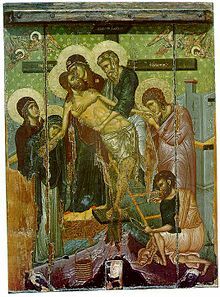 Icon of the Crucifixion, 16th century, by Theophanes the Cretan (Stavronikita Monastery, Mount Athos) -Good Friday, the day when Christians remember the crucifixion of Jesus. The crucifixion and resurrection are the central events in the Christian faith. That is why Good Friday and Easter Sunday are such important days in the Christian year. The cross is the central theme of worship. Rev. Alkiviadis Calivas:On the Great and Holy Friday we commemorate the holy, saving and awesome sufferings of our Lord and God and Saviour Jesus Christ: the spitting, the striking, the scourging, the cursing, the mockery; the crown of thorns, the purple cloak, the rod, the sponge, the vinegar and gall, the nails, the spear; and above all the cross and the death, which He voluntarily endured for us. Also we commemorate the saving confession of the grateful thief who was crucified with Him. Christmas and Easter can be subjects for poetry, but Good Friday, like Auschwitz, cannot. The reality is so horrible, it is not surprising that people should have found it a stumbling block to faith. We may say that on the first Good Friday afternoon was completed that great act by which light conquered darkness and goodness conquered sin. That is the wonder of our Saviour's crucifixion. On the Great and Holy Friday we commemorate the holy, saving and awesome sufferings of our Lord and God and Saviour Jesus Christ: the spitting, the striking, the scourging, the cursing, the mockery; the crown of thorns, the purple cloak, the rod, the sponge, the vinegar and gall, the nails, the spear; and above all the cross and the death, which He voluntarily endured for us. Also we commemorate the saving confession of the grateful thief who was crucified with Him. Today is Good Friday, observed worldwide by Jesus buffs as the day on which the popular, bearded cultural figure, sometimes referred to as The Messiah, was allegedly crucified and—according to legend—died for mankind's so-called sins. Today kicks off a 'holy' weekend that culminates on Easter Sunday, when, it is widely believed, this dead 'savior'—who also, by the way, claimed to be the son of a sky-dwelling, invisible being known as God—mysteriously 'rose from the dead.' According to the legend, by volunteering to be killed and actually going through with it, Jesus saved every person who has ever lived—and every person who ever will live—from an eternity of suffering in a fiery region popularly known as hell, providing—so the story goes—that the person to be 'saved' firmly believes this rather fanciful tale. Good Friday is the birth of the Church from the pierced side of Jesus.... On the altar of the Cross, the sharing of the broken bread and the common cup at the table of the Last Supper received its full meaning as Supper of the Lamb slain for our redemption. The cross that marks the place of the Eucharist will always call attention to the awesome mystery of Calvary. The fast of Lent, culminating in Good Friday, is an important part of my life as … God, principally through fasting, but also through prayer, Bible study, alms-giving, and attending special [[w:Church services|church services. Good Friday, the day when Christians remember the crucifixion of Jesus. The crucifixion and resurrection are the central events in the Christian faith. That is why Good Friday and Easter Sunday are such important days in the Christian year. The cross is the central theme of worship. Good Friday is the Friday before Easter. The Catholic Encyclopedia defines it as the “the Friday on which the Church keeps the anniversary of the Crucifixion of Jesus Christ”. Most churches today would agree with that definition. All four gospels indicate that the day of the crucifixion of Jesus was a Friday, because the following day they describe as Sabbath, our Saturday, and because they state that the visit of the women to the tomb on the next day was on the first day of the week, our Sunday. One of the most inauspicious days for washing was “Good Friday”.... Clothes hung out on that day would be spotted with blood & a story is told that Jesus cursed a woman who was washing clothes as he passed by on the way to Calvary. Matthew Henry:Christ died He left a will in which He gave His soul to His Father, His body to Joseph of Arimathea, His clothes to the soldiers and His mother to John. But to His disciples, who had left all to follow Him, He left not silver or gold, but something far better – His PEACE! Gwyneth Windsor: Some Church Choirs perform some special music on Good Friday. A popular choice has been Stainer’s Crucifixion which tells the story of the Crucifixion in words and music. A lone voice begins, ‘Could ye not watch with me one brief hour? The haunting words and melodies have helped countless Christians to rethink the meaning of Jesus’ death. 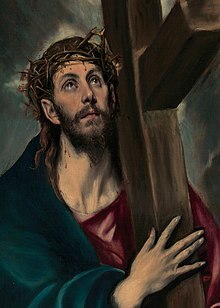 Christ died He left a will in which He gave His soul to His Father, His body to Joseph of Arimathea, His clothes to the soldiers and His mother to John. But to His disciples, who had left all to follow Him, He left not silver or gold, but something far better – His PEACE! It was the preparation of the passover - For this reason both the Jews and Pilate were desirous to bring the matter to a conclusion. Every Friday was called the preparation, (namely, for the Sabbath.) And as often as the passover fell on a Friday, that day was called the preparation of the passover. Then took the body of Jesus, and wound it in linen clothes with the spices, as the manner of the Jews is to bury. (John 19:40) Now in the place where he was crucified there was a garden; and in the garden a new sepulchre, wherein was never man yet laid. [In the place where he was crucified - There was a garden in the same tract of land: but the cross did not stand in the garden.] (John 19:41)There laid they Jesus therefore because of the Jews' preparation day; for the sepulchre was nigh at hand. (John 19:41) [Because of the preparation - That is, they chose the rather to lay him in that sepulchre which was nigh, because it was the day before the Sabbath, which also was drawing to an end, so that they had no time to carry him far. John 19:14, in "Wesley's Notes on the Bible:John 19". In his Good Friday sermon the w:Archibishop Romero interprets the seven words from the cross. This has long been a preacher’s tour de force. It is not at all uncommon for a preacher to deliver a separate sermon from noon until three on Good Friday. The Good Friday liturgy prescribes the reading of the whole passion narrative from the Gospel of John. One expects a long service on Good Friday Romero quotes Christ's comment to John and James when these two disciples asked Jesus for a special place in the kingdom of God. From the earliest ages of Christianity, Good Friday has always been observed as a solemn fast, and been marked with that special respect which its sanctity demands. In ancient days it was called Long Friday, from the length of the religious services; and by our forefathers it was termed Holy Friday. Christians remember the words spoken by Jesus from the cross during special Good Friday services. These services are frequently based on Jesus’ seven sayings from the cross. During the service there are suitable hymns for Good Friday, and times of silence in which Christians can think about the death of Christ. They believe that Jesus died on behalf of everyone in the world. Some Church Choirs perform some special music on Good Friday. A popular choice has been Stainer’s Crucifixion which tells the story of the Crucifixion in words and music. A lone voice begins, ‘Could ye not watch with me one brief hour? The haunting words and melodies have helped countless Christians to rethink the meaning of Jesus’ death. ‘What is truth?’ So in that drama which decided the whole fate of antiquity, one of the central figures is fixed in what seems the reverse of his true role. Rome was almost another name for responsibility. Yet he stands for ever as a sort of rocking statue of the irresponsible. Man could do no more. Even the practical had become the impracticable. Standing between the pillars of his own judgement-seat, a Roman had washed his hands of the world. Because of the penitence and sorrow associated with the Crucifixion, the Divine Liturgy is never celebrated on Good Friday, which Eastern Orthodox call "Holy and Great Friday", except when this day coincides with the feast of the Annunciation. The faithful revisit the events of the day through public reading of the Psalms and Gospels, and singing hymns about Christ's death. Rich visual imagery and symbolism as well as stirring hymnody are remarkable elements of these observances. In the Orthodox understanding, the events of Holy Week are not simply an annual commemoration of past events, but the faithful actually participate in the death and resurrection of Jesus. Because of the penitence and sorrow associated with the Crucifixion, the Divine Liturgy is never celebrated on Good Friday, which Eastern Orthodox call "Holy and Great Friday", except when this day coincides with the feast of the Annunciation. The faithful revisit the events of the day through public reading of the Psalms and Gospels, and singing hymns about Christ's death. Rich visual imagery and symbolism as well as stirring [[w:Hymnody|hymnody are remarkable elements of these observances. In the Orthodox understanding, the events of Holy Week are not simply an annual commemoration of past events, but the faithful actually participate in the death and resurrection of Jesus. Each hour of this day is the new suffering and the new effort of the expiatory suffering of the Savior. And the echo of this suffering is already heard in every word of our worship service -unique and incomparable both in the power of tenderness and feeling and in the depth of the boundless compassion for the suffering of the Savior. The Holy Church opens before the eyes of believers a full picture of the redeeming suffering of the Lord beginning with the bloody sweat in the Garden of Gethsemane up to the crucifixion on Golgotha. Taking us back through the past centuries in thought, the Holy Church brings us to the foot of the cross of Christ erected on Golgotha, and makes us present among the quivering spectators of all the torture of the Savior. Holy and Great Friday is observed as a strict fast, and adult Byzantine Christians are expected to abstain from all food and drink the entire day to the extent that their health permits. On this Holy day neither a meal is offered nor do we eat on this day of the crucifixion. If someone is unable or has become very old [or is] unable to fast, he may be given bread and water after sunset. In this way we come to the holy commandment of the Holy Apostles not to eat on Great Friday. On this Holy day neither a meal is offered nor do we eat on this day of the crucifixion. If someone is unable or has become very old [or is] unable to fast, he may be given bread and water after sunset. In this way we come to the holy commandment of the Holy Apostles not to eat on Great Friday. Holy and Great Friday is observed as a strict fast, and adult Byzantine Christians are expected to abstain from all food and drink the entire day to the extent that their health permits. Jesus Christ died at 3 p.m. on the Good Friday, April 3, 33AD and rose again at 4 a.m. on April 5. The New Testament says that Jesus Christ died on the day after the first night with a full moon following the vernal equinox day. The astronomers employed information about revolution of the planets within 26-35 AD and found out that it was only two times within the period that the fool moon followed the vernal equinox immediately. The first date was Friday, April 7, 30 AD and the second time this combination repeated was April 3, 33AD. However, the Bible also mentions a solar eclipse that occurred during crucifixion of Jesus Christ. According to astronomy records, a partial solar eclipse was registered only in 33AD. Reasoning attributed to Bible for determination of the date of Christ’s death, in "Date of Christ's Death Pinpointed (16 May 2003)". ... Because people remain to pray before the Blessed Sacrament, any work on the environment should be done in silence, particularly if the place of repose is within earshot....The Blessed Sacrament is brought into the sanctuary for Holy Communion along with a fair linen, corporal and candles. These are returned to the altar of repose and the sacristy, respectively after Communion. The rubrics call for the altar to be stripped and the removal or veiling of crosses after the liturgy in preparation for Good Friday. Veils should be violet in color. If the font is to be emptied, this may happen at this time also. While the church need not be stripped of furniture and art, generally simplicity should be the norm for Good Friday. Because people remain to pray before the Blessed Sacrament, any work on the environment should be done in silence, particularly if the place of repose is within earshot....The Blessed Sacrament is brought into the sanctuary for Holy Communion along with a fair linen, corporal and candles. These are returned to the altar of repose and the sacristy, respectively after Communion. Eugen J. Pentiuc:...Initially, the epitaphios depicted the amnos (lamb), the dead Christ. By the fourteenth century the epitaphios became the epitaphios threnos (burial lament). Instead of a solitary Christ lying dead as in the early epitaphios, the epitaphios threnos, depicting a funeral gathering of figures, includes the lamentation of the Theotokos over the dead son. The emergence of the epitaphios from the Late Byzantine era 121 is related to the standardization of the Holy Saturday service (called Lamentations and held by anticipation on the evening of Good Friday) in the fourteenth century. Initially, the epitaphios depicted the amnos (lamb), the dead Christ. By the fourteenth century the epitaphios became the epitaphios threnos (burial lament). Instead of a solitary Christ lying dead as in the early epitaphios, the epitaphios threnos, depicting a funeral gathering of figures, includes the lamentation of the Theotokos over the dead son. Ironically, the soldiers who crucified Jesus then gambled for his clothes. But Jesus said, 'Father forgive them, for they don't know what they are doing'. Ruben Enaje: It is painful and difficult. But I will continue doing this for as long as I can. This is my pledge to God. Dozens of people were nailed to crosses in the devoutly Roman Catholic Philippines on Good Friday, in a gruesome re-enactment of the crucifixion, while others atoned for their sins by flaying themselves with bamboo whips or paddles tipped with broken glass. The ritual has become a Good Friday tradition in certain villages, where tourists flock to hear the locals scream in agony as seven-inch nails are driven into their hands and feet. Penitents are then hoisted up on crosses and left for five minutes in the scorching sun before the nails are pulled out. It is painful and difficult. But I will continue doing this for as long as I can. This is my pledge to God. Ruben Enaje, donned a crown of thorns in Cutud [near Manila] before being nailed to a cross for the 22nd time. Mr Enaje, a 47-year-old decorator told he had missed the ritual only once, eight years ago. He was subsequently stricken with stomach ulcers and his wife was taken ill.
[just a] show. The spiritual dimension is totally lost. In Greece and a number of other countries it is customary to eat something on Good Friday to which vinegar is added, in memory of the vinegar that Christ was offered on the cross. To this good soup the vinegar adds a symbolic touch… Unlike [today] Good Friday, when it is to be found throughout Lent, the Hot Cross Bun was originally eaten only on Good Friday.